The Emerson NetSure 802 (formerly LPS) utilizes a highly integrated revolutionary design to pack unparalleled capacity and features into a small footprint. 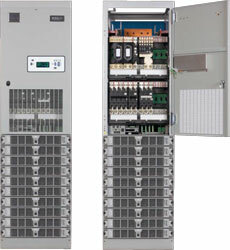 The NetSure 802 is a -48VDC digital power plant that operates with 200 amp rectifiers powered from 480VAC or 208VAC. Each bay provides power conversion and distribution – up to ten rectifiers (2000 amps total) along with 2400 amps of distribution. Adding additional bays creates larger plants up to 16,000 amps. The expanded NetSure 802 Series introduces separate, stand-alone power and distribution bays complementing the system’s compact combination bays and integrating easily with existing AC infrastructure. The NetSure 802 provides a space savings of nearly 30% over conventional switch-mode power plants without sacrificing the overall cable management of the plant. The platform integrates AC distribution (PDSC), battery disconnects, and comprehensive LMS1000 monitoring capabilities into the DC system seamlessly with a depth of features never before seen in the industry. For more in-depth information, see the NetSure 802 data sheet.